I didn’t grow up in a barrio, or anything like a neighborhood like Villa Nuevo Pueblo Duarte in East Santo Domingo. It’s poor, and there isn’t a lot of work for the people who live here. Most people try to avoid areas like these and stick to the beaches. “You know it’s dangerous though right?” he added. 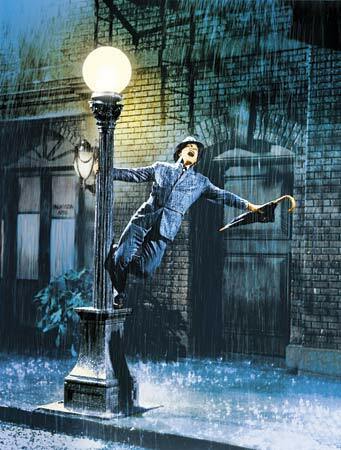 Well, normally it wouldn’t be safe, but somehow it’s safer with someone like Gene Kelly. Sometimes when we lose water, we go visit some of the relatives who live nearby. Joseas is always first to grab my hand, and he leads the way. He dances like everyone’s watching, and sings like they are recording his performance. He pulls me forward like he’s trying to pull a rock, and at other times I have to drag him, half-swinging him from my one arm. He’s either mumbling, or he’s singing, I can’t tell. He doesn’t make any sense, not even in Spanish. But that’s not really important in this situation. We’re out for a stroll aren’t we? Now he’s definitely singing, singing something. I don’t recognize the song, so I’m pretty sure he’s improvising. He’s got a thousand ideas stored up for nights like these. He’s actually matching the rhythm to the cadence of our walk. He’s encouraging me to join him, but as soon as I do, he switches to a new phrase. I try to get him to jump when we come to a speed bump, but now he’s engrossed in his serenade to the night, to the water that hasn’t come for days. 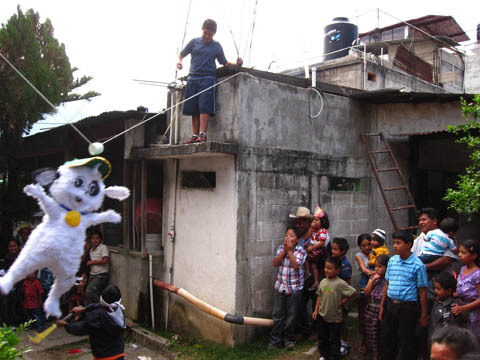 It doesn’t bother him that there’s no water, nor electricity in the barrio. He’s just out for a stroll, singing in the barrio. 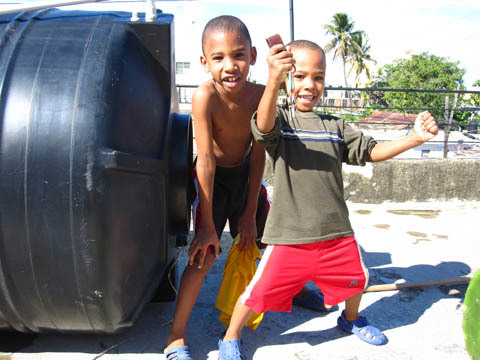 This entry was posted in Dominican Republic, Santo Domingo on November 30, 2010 by Aaron. 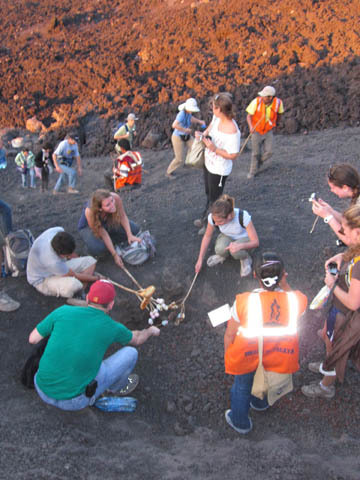 The following is a series of events and thoughts that began with the intention of reading a newspaper as a means to study for an internationally recognized Spanish certification (the DELE) and serves to illustrate the random connectedness that a life of traveling provides. All within a half day. I headed out to find a public car to go into the Colonial Zone of Santo Domingo. Public cars are like taxis; actually more like buses in that they travel specific routes, and usually you’ll get to ride in a 20 year old car with at least 4 other Dominicans (not including the driver). I came to the junction in front of my barrio and a public car had just dropped off someone on the other street, he yelled to me and I said “Parque Independencia” which is a general endpoint – you can get out of the car anywhere from here to there for $0.50. He did a U-turn in the middle of a busy road. At a good cross street to walk South to the Colonial Zone the driver asked me more specifically where I wanted to go. I said “toward Parque Independenica” and he responded “that’s far” to which I thought, “True I should just get out here.” I set out on foot South toward Colonial Zone and passed by some Colonial homes where I could feel the air conditioning flow out of an open window into the street. Air conditioning and gas street lights, and old men sitting, drinking coffee outside small “colmados” (cafe/diner/store). I sat down at a cafe in front of the oldest Cathedral in America (Cathedral of Santa María la Menor) and started reading yesterday’s news. I chuckled to myself that “yesterday’s news” gets such a bad rap, yet to me, it holds immense value. First of all, it’s usually free, and for the purposes of learning Spanish, it’s an excellent tool. I read an article about how insurance companies in the United States are starting to use the online records of people’s lifestyles, habits, activities, diets, magazine subscriptions, gym memberships to calculate premiums. Just think if Google sold our information to an insurance company . . . despite the disutopian consequences, some of us would enjoy better premiums I suspect. A guy sitting at the next table was speaking English, so I asked him where he was from. He told me that he’s from England, but he’s working in Haiti with the World Bank, but he’s not there now, because it’s not safe. I pointed to the front page of my (yesterday’s) newspaper and said “because of the Cholera and the Elections?” “Absolutely,” he responded. He was reading a technical article about the efficacy of Microfinance’s long term positive effects, and he encouraged me to read up on the information provided by the Center for Global Development before my trip with HOPE International this week. I took a break from reading the newspaper. Actually, I took a walk and threw it away. I considered buying today’s news, but I’ll wait until tomorrow – when it’s free. I settled on sitting in Columbus Park (Cathedral of Santa María la Menor) and read about Screenwriting. I realized that most movies try to grab your attention in the first 10 minutes, and statistically, this is the point when the audience will stay attuned to the story, or let their mind drift. A pigeon crapped in my book. I suppose that further illustrates the page I was reading about “inciting” incidents. It’s the tool in movies where the story suddenly surges forward. I realized that if I was to keep the rest of these pages “pigeon free” I really should head back to get my haircut. Listening to the conversation in the barbershop, I realized, then and there that while the DELE is the internationally recognized foreign language exam for Spanish, participating in a conversation about the barber’s brother’s baseball team in a Dominican Barbership could signify the highest accreditation. See, the only part of the conversation I understood was when he pointed at the poster on the wall and said that they have a game tomorrow night at 7:30. I walked back to the house, only 3:00 in the afternoon, and I decided to take the DELE within the year, and possibly take up the invitation to watch the barber’s brother’s baseball team sometime this week. This entry was posted in That's Odd on November 29, 2010 by Aaron. I’ve been thinking about my previous post, “The Transparency of Kindness” since I’ve been in the Dominican Republic, and I’ve seen yet more evidence of the goodness in this world. It’s always a difficult process to switch from a place where you’ve felt comfortable to a place where you’ve never been, and you don’t speak the language. By the end of my three months in Guatemala, I felt like I could pretty much understand every conversation, and I could communicate myself fairly well. But, my first night in the DR with my new family, I felt like I knew zero Spanish. Between the accent and speed, my comprehension suffered greatly. I felt like an outsider again. Like most difficult things, it got easier, and just a few days later, I started to have an ear for the accent and the speed. The Moreta Family helped me out tremendously. They fed me dinner even though I arrived when they were going to have a meeting at their church. They slowed down their conversation so I could understand what was going on. They gave me a room. They said I could set my stuff down, and they said that it was my place to rest. I think about how strange it has to be for them to open up their house to a foreigner. They gave a room to someone they’ve never met. They let their kids crawl over this stranger and they serve him first at the table. So strange and so amazing. It’s this transparency of kindness that I have grown to love since I’ve been traveling. I feel like I am able to see it so clearly now, and I want to savor it as much as I can. I know that while I’ll be here for quite some time, I will eventually return to the states. Does that mean I will lose the ability to see it? I mentioned before that I believe that you don’t need to leave the country to see the goodness of this world, but I wonder if I will immediately fall back into my old mindset? I would like to believe that there are some things in this world that permanently shift the way you think about your life and the world you live in. There are some things you’ll never be able to turn your back on. Hmm . . . will I turn my back on how people have helped me in each country I’ve visited? How easy it would be to say thanks and move on. How easy it has been to sit at the family dinner table and walk away when I’m finished eating. I guess I’m alluding to a fundamental question: does kindness demand a response? Is it enough to just be able to see the goodness of this world? Is it enough to say thanks? Is it enough to take a few photos and write a few posts about my gratitude? I believe kindness begets kindness. And maybe, I can’t turn my back on my experience.
. . . Haha, is that all I’m going to think? Sometimes kindness is clarity. 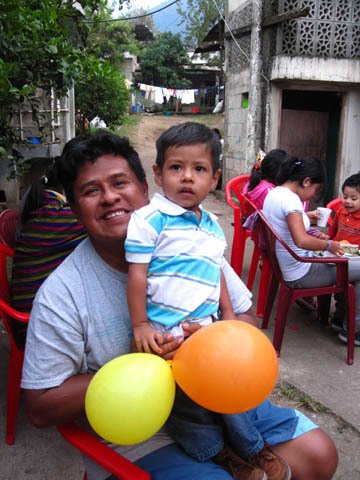 Antonio was an orphan that probably would have died if the family didn’t provide for him. Today, if we didn’t do the laundry, we might not have the chance to do it for awhile. Sometimes, it’s clear that kindness demands a response. If this family is going to feed me and give me a room, then maybe I can help them do laundry. After all, with two young boys, there are always dirty clothes to be cleaned. Rebeca knows this because she comes from a family of 11 siblings, and Federico from a family of 14 siblings. There was always laundry to be done, and you had to do it when you had the opportunity.
. . . I walked upstairs to hang up some clothes, end of story. This entry was posted in I didn't plan this, Unexpected Blessings on November 24, 2010 by Aaron. I’ve experienced some amazing moments of kindness since I started traveling in August. Moments where I stop and realize that there is goodness in this world, and even though someone does not have money or status, they can change someone else’s life. To me, I thought that to make a difference in someone’s life, you needed to have enough money and education. You had to be in a position of power to positively affect someone else. But there were many moments, and continue to be experiences, where I realize that being educated, having money, skills or talents is irrelevant. Absolutely irrelevant. What matters most is desire, and the willingness to step forward and make yourself available. Out of many, many examples over the past 4 months to illustrate this point, I’m going to talk about Antonio. Antonio is a Guatemalan in his thirties (possibly early forties). Early on in his life, his diminutive status and diminished mental capacity limited his ability to work led his family to cast him out in the streets to survive on his own. He’s an orphan, and because he never grew up around a family or had consistent relationships until he was 12, his language skills are limited. He doesn’t even speak Spanish. When you want to talk to him, you either have to know Tz’utujil or use body language, and work at it both until he understands. He has no wealth nor the potential for earning it. In the modern world, he has nothing to offer, but yet, he has a room in a home, three meals a day, and a family to call his own. How? When people ask me what I’ve thought about Central America, I usually respond that people are so kind, so incredibly gracious and welcoming. I say it because it is a point of contrast between the United States and the Central American culture. I say it because I’m a single, young American, without any dependencies, and everything I consider to be safe, secure, and good has come from hard work and the protection of what I’ve been given or earned. Sometimes, I think that to survive in this world you have to fight, and that to admit weakness, or softness is a dangerous admission into vulnerability. 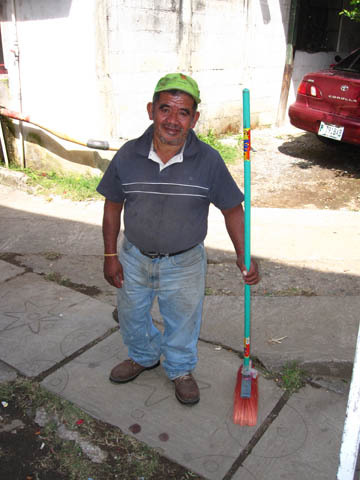 Antonio lives with the Cortez family, and has lived with them for over 20 years. They found him on the street and felt sympathy for him and gave him a home, and more importantly, they gave him a family. He’s got a role in the family and it matters that he follows through with it. He has to fill the water into the outdoor sinks and replenish the firewood, or the food making (which starts at 6:00am) will not happen. I’ve seen him many times at 5:00am wearing a stocking cap and a winter coat carrying firewood up to the second floor. He always wants me to pass by him, and he won’t let me wait for him to finish his trek up the steps. My perspective has been changing about how this world can work. I have seen too much already to continue with my old mindset. While I haven’t usually taken the time to record my thoughts on this blog, or captured the moments with a photo, in some ways, I don’t want to. There is something special and unique about knowing that when a moment exists it will pass and will forever never be recorded in words or images. I believe these moments are precious, and they have become some of my fondest memories. The first time I saw Antonio’s room was when I went up the steps one evening up to my room. The experience made me stop, mid-steps, and think about what it means to be an orphan, or a son, or a traveler in this world. His room, in a word, is “security.” The family gave him something that will always be his. 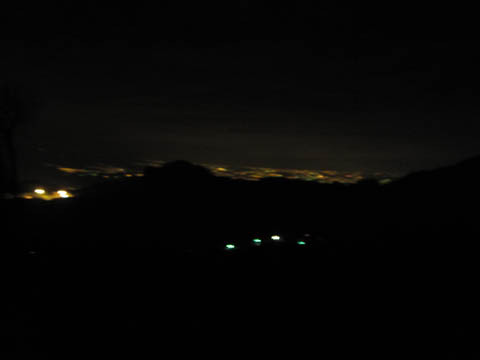 He has a single bulb that lights up his small dwelling place. I saw a picture of the Cortez family, a picture of Jesus, a dresser, a neatly made bed, and his boots placed next to his shoes underneath his small coat rack. I paused on the steps, and thought about the preciousness of having a room to call your own. To have a place where you can set your stuff, fold and store your clothes, and rest in privacy. The times I’ve felt most comfortable while traveling in the past four months has been when someone has given me a room to my own. It’s then that I know that this place will be mine, and mine only, and I and my various possessions, will be safe here. Antonio’s room is his firm grip on this world. Even though this world has been cold to him and deserted him so many times, this room is something that will not be taken away. It is his, and his only. I don’t have a picture of Antonio’s room, and I will never have a picture of it. It’s his room. It’s where he feels safe. I’ll leave it in his possession. I guess, one could say that you really need to leave the borders of the western world to see such kindness of the Cortez family, but I don’t think that’s fair to our society. Kindness exists in our culture every day, but it is so easy to overlook. We get lost in our schedules, in our obligations, and in our entertainment. So I suppose what happened to me was not that the world was suddenly filled with these moments of real kindness, it’s that I was finally able to see them. And now, I see it everywhere. 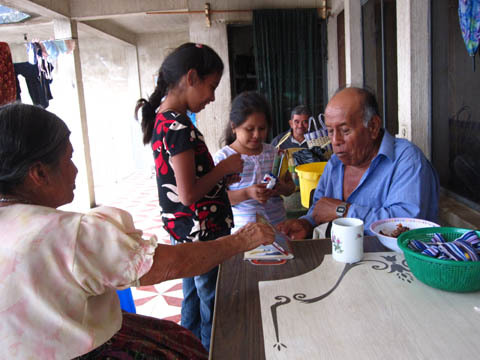 This entry was posted in Beauty, Guatemala, San Pedro La Laguna, Unexpected Blessings on November 22, 2010 by Aaron. There was a big group hanging out in the San Jose airport to catch the 2:05am flight to Fort Lauderdale. As I was standing in line to check in and there was a couple from the States, and we started talking about how early or late it was in the evening. The husband asked where I was from and when I told him “Virginia” he said that there was a young guy hanging out from Virginia who was having a problem with his debit card. The young man hadn’t yet gotten the deposit back from the rental car company, so he didn’t have enough money to buy a ticket home and was going to have to spend the night in the airport without any money or food. He was going to stay up as late as he could so that he would be able to sleep straight through until the morning because he didn’t want to wake up and be hungry and have no money and no food for the rest of the night. The couple wished there was something they could do. After I checked in I headed toward the security and found the guy who looked like he was trying to get comfortable on an airport bench. So I gave him the extra sandwich and a bag of peanuts and raisins I had in my bag. He was in such disbelief and was so grateful for the food, he just sat there looking at me. As I walked away he immediately tore into the sandwich. Both he and his wife smiled. They told me they were just coming back from their honeymoon, and the felt bad they couldn’t do anything for the guy. I stepped back and thought about this small event and how it really wasn’t me at all. It was first Josh who encouraged me to make another sandwich, and then it was probably the guy’s wife who felt terrible for the young man and encouraged her new husband to do something (I mean think about it, “Honey, are you going to let that young man starve? What if he was our son? Would you want him to be sitting in the airport all alone with no money and no food?”), and then there was the husband who was incredibly concerned but still powerless to do something about the situation. And then there was me, the fourth person in the chain with an extra sandwich that got to help a neighbor in Virginia. As simple as it sounds, from now on, I think I’ll pack an extra sandwich and begin a campaign for packing extra sandwiches. You never really know which person you’ll be as you wait for an early morning flight. 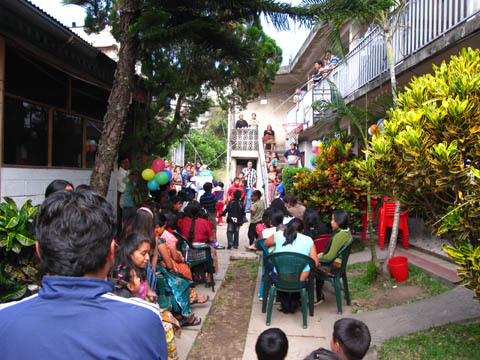 This entry was posted in I didn't plan this, Unexpected Blessings on November 16, 2010 by Aaron.
. . . because you can be the only Gringo at a 2-year old’s birthday that gets to eat dinner with about a hundred Guatemalans. 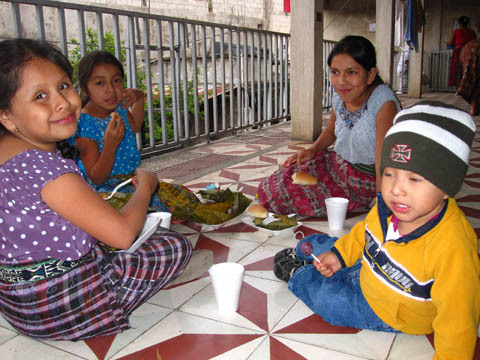 Dinner with the kids: Tamales! 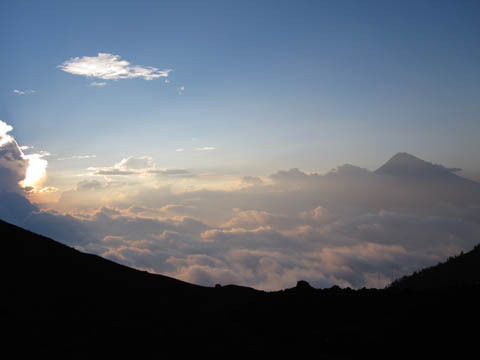 This entry was posted in Guatemala, San Pedro La Laguna on November 7, 2010 by Aaron. I was right, but of course, Tim is usually up for anything. It was a good thing he has such a flexible attitude because I arrived in Antigua at 1:15pm, an hour later than I expected, and our shuttle to the Volcano was to leave at 2:00pm. Book our travel for the next day and decide if we were going to plan out the next six days ahead of time or go as the wind would lead us. We were eating our sandwiches when the shuttle pulled up. Plenty of time. There always is. 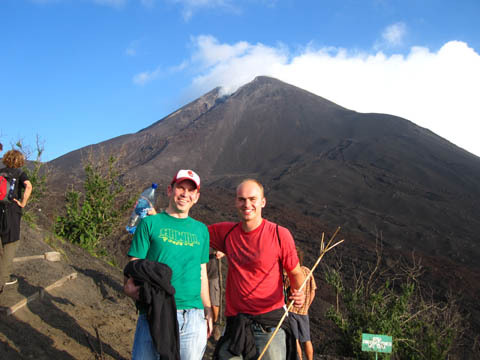 Tim had been in the country less than 2 hours and here he was just a few kilometers away from the Pacaya Volcano. 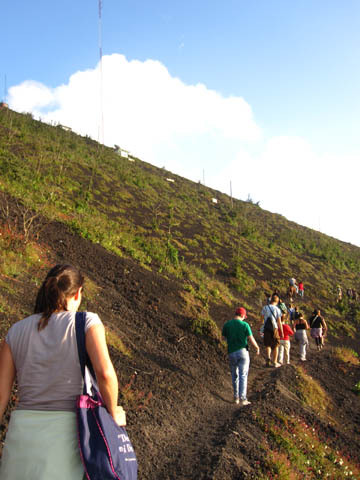 This was the first Volcano I had hiked, and I was really excited to climb it to see the lava. 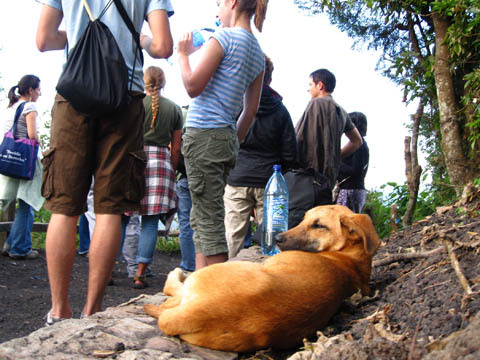 For this special journey we nicknamed our fellow traveler, “Rosie” though we were pretty sure it was a dude dog. 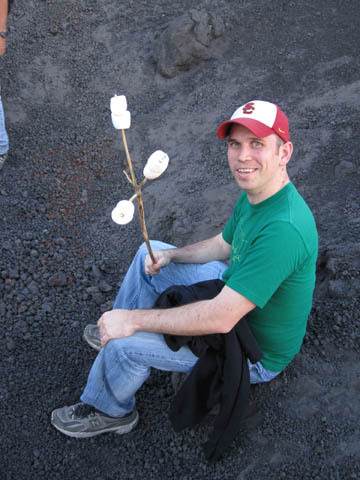 Up at the top of the Volcano they let you roast marshmellows. Some people in our group decided they were going to toast sandwiches. 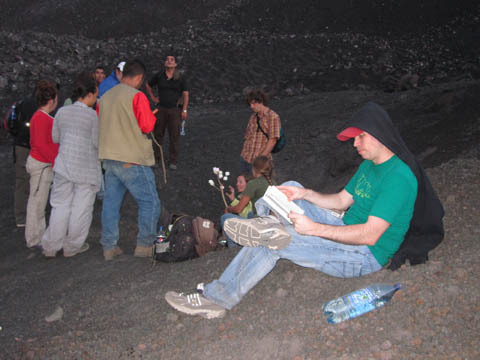 Tim got bored with the volcano and decided to crack open his book and read a bit next to the Lava Cafe. It was so crazy to walk inside the earth, and it felt good to get out of the cold. After the fun and games at the top we descended down the volcano, mission complete. 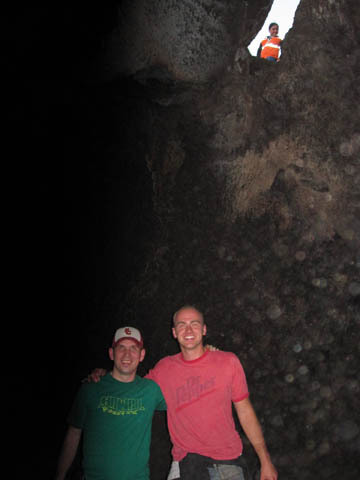 This entry was posted in Friends, Guatemala on November 2, 2010 by Aaron.